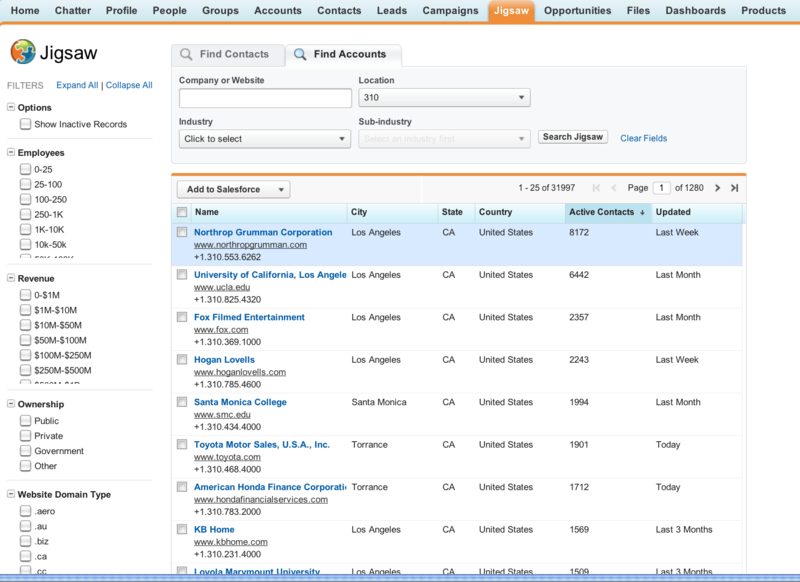 A year or so ago when salesforce.com acquired contact data cleansing company Jigsaw, many of us saw it as a natural progression but wondered how salesforce would integrate the product into its own suite and what their approach to selling Jigsaw would be. Well today we have an answer to that question with salesforce releasing Jigsaw fully integrated into the salesforce product. First a reminder about Jigsaw – their schtick is crowd sourcing contact information. This becomes important when you hear that studies have found 70% of contacts go stale every year – either due to changes in employment, in role, or in contact details. Jigsaw leverages the crowd to clean that data and have it as up to date as possible. This is actually rather a big deal – all of salesforce’s 100,000 or so customers will have access to the community driven data that Jigsaw produces, and salesforce gets a nice customer acquisition strategy – users can search records for free but data cleansing and full-contact information comes at a price – $99 per user per month. I spent some time at salesforce HQ with Scott Holden from product marketing and managed to strongarm him into giving me a live demo. I was actually pretty impressed with the speed of the Jigsaw app – often re architecting an application onto a new platform comes at a performance cost – in this case contact searches and data cleansing was crisp and fast. …You get a productivity benefit by empowering your sales and marketing teams with ability to instantly prospect and access data updated in real-time, and that is best achieved by a 1-to-1 seat to user ratio. Our customers have found that having single person as the only “gate-keeper” to clean data is not a scalable solution. One interesting use case that Holden told me about was with companies running marketing campaigns. He explained the difficulties involved in running campaigns that require visitors to input lots of information beyond name and email address. Apparently Marketo is running campaigns where they only require the name and email address of the visitor, and are then dumping that information into Jigsaw where all the remaining fields (company, position, sector, revenue etc etc) is populated. Marketo is reporting a 20% increase in sign ups in some cases – in an industry where points of a percent improvements are cause for concern – that’s a pretty compelling result.